You can earn LBRY Credits (LBC) for referring others to use LBRY. In the latest version of the LBRY app, you can now view the status of your referrals and invite new users to LBRY via email or referral link. The "Invite" area can be found by clicking "Invite" from the left side of the app. You will see all of your referrals, along with their status(es) - whether the user has accepted it (signed in) and if it is claimable or not (if the user is reward approved). How many LBRY Credits do I earn and how do I see how many credits I've earned? New invites sent via the LBRY app are eligible for a 20 LBC reward. If you have claimable rewards, you will see a claim button with the total reward amount on the page. You will not receive rewards for each referral until those users join and use LBRY themselves (see below section regarding claimable referrals). This is to combat referral fraud and abuse. 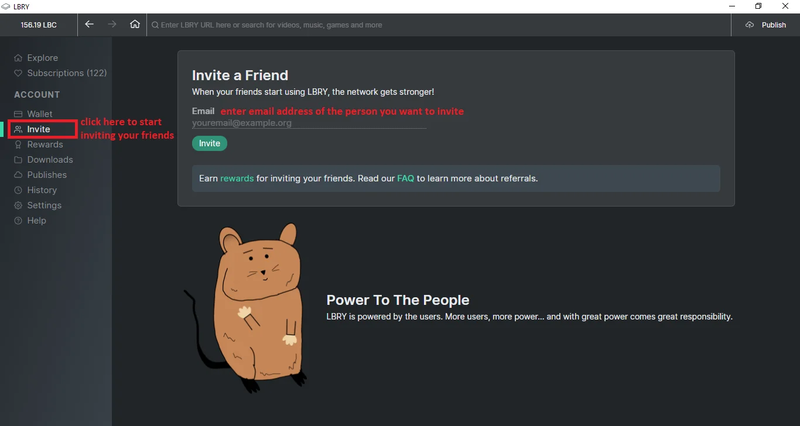 After a user clicks, installs and registers their email with LBRY, it may take up to an hour for the invite to appear on your Invites page. What are the criteria for a claimable referral? A claimable referral has the same definition as a Rewards eligible or Verified LBRY user. This means the referred user must have logged into the LBRY app and verified their account. LBRY users who abuse either the Referral or Rewards system will not be eligible for referral redemption. If you have specific questions about individual referrals which are not claimable, please reach out to the helpdesk with details. What is the difference between Accepted and Claimable? Accepted means the user has signed into LBRY. Claimable means they have verified their account. If you expect to refer more than 50-100 people, please discuss it with us on Discord chat or email us. Currently, there is a limit of 10 redemptions per account. I have a clever idea to cheat the referral system. If you want to waste your time to receive no reward, be our guest. We will be monitoring the system closely and will be going to significant lengths to only allow legitimate users to join. Rather than spending the time attempting to cheat and failing, we suggest you do productive work to earn LBRY credits. Join our Discord chat and message or email Tom (@jiggytom) or Julie (@jsigwart) for opportunities.